For Cresswell, mobility is actually three mobilities that mutually constitute one another. Representations of mobility are the photos, literature, philosophy, etc., that capture mobility and try to make sense of it, usually in ways that are ideological. They might link mobility to freedom, transgression, creativity, life and so on. They reproduce mobility and interpret it according to a particular worldview. Experienced mobilities are mobilities that are practiced, embodied, ways of being in the world, as well as how we experience and feel about mobility. Mobility is both subjective and objective, and the perspective from which we experience/ study mobility has a lot to do with how we interpret it. Because mobility is both subjective and objective, it is also both socially constructed and universal, in the sense that everything moves, and the interplay between this universal fact of life and a particular movement within a particular context gives that movement meaning. Mobility is thus a “necessary social production,” and a way of inextricably integrating geography with the politics of social life. 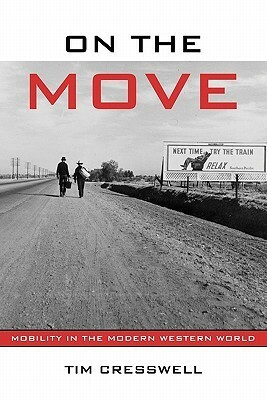 Cresswell’s writing style is wonderfully clear and engaging, and his many case studies, as well as his brief history of the development of mobility into an individual right in the modern capitalist state, cover mobility at a variety of scales ranging from the individual to the workplace to nation, empire, and the placeless place of the Shiphol Airport. The only thing missing, maybe, is a study of imperial movement from the perspective of the colonized, with some attention to the relationship between labor migration and uneven development. This entry was posted in body, Cultural Geography, dance, immigration, meaningful movement, migration, mobility, movement, objectivity, photography, place, place and region, space, subjectivity, transportation on April 9, 2013 by Kirsten.